Whether you are looking to update a vase or are looking to add some extra glam to dresser, glass beads are the new way to go. 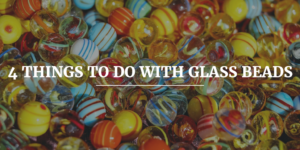 Not only are glass beads perfect for around the house crafts, they also are very kid friendly. This means that you and your child can bond while creating some amazing creations. Best of all, all of these projects will make amazing handmade gifts for your friends and family this holiday season. Here are some great crafts and uses for these delightful little beads that are sure to give you a wonderful outcome. A wind chime is great way to add some whimsy to an outdoor space. They are not only relaxing to listen to; they are delightful to look at. By using glass beads to make your wind chime instead of traditional tin and other metals, you can create some really colorful patterns and even customize them to the style of your home. This simple project also is great because it utilizes objects and materials that you may already have lying around your house. To start you will need a bunch of glass beads, ranging in different sizes, just make sure to use glass beads that have a tunnel running through the center. Choosing the colors and patterns of the beads is where you can get really creative. You will also need some sort of stick or dowel rod as well as fishing line or plastic thread. From there you just want to string the beads in whatever pattern you wish and attach them using the fishing line to your dowel rod. After you have assembled your wind chime, finish it off with some invisible threading through to top and loop it to hook onto your outdoor space. The result is a beautiful hanging set of glass beads that radiate and shine when the sun hits it. Mirrors are a great way to utilize smaller spaces because they give the illusion of a more open area. But just using a mirror, however, can get dull. A great way to jazz up a standard framed mirror is to add glass beaded details. Not only is this a quick and easy craft, it is really inexpensive as well. To help keep the cost low, scour local thrift stores and flea markets to find a great mirror that is need of a little TLC. Try to find one that is already framed, the frame doesn’t have to be pretty because it will be just used as a home for the glass beads. The best way to achieve this look is to find glass beads that have a flat bottom. From there, make sure to clean the mirror and frame and let it air dry. Once dry use a strong holding glue to create a pattern with the glass beads on the frame. You can get super creative with colors and styles to create something that fits perfectly with your design aesthetic. Making little glass bead vases is a great craft to do with children. This is also great for kids who are looking for a gift to get their teachers and parents this holiday season. Because you can choose from any shape or size of vase you want to use, these vases have many more purposes beyond just holding flowers. They will make a great pencil holder for any teacher’s desk while also being a great place to keep jewelry and coins. 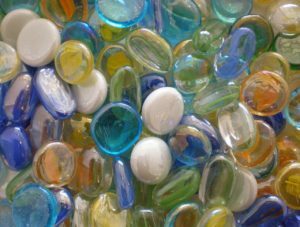 This is also one of the easiest glass bead projects on this list making it perfect for little ones to proudly accomplish. All you will need to do is find whatever size and shape vase you want to use. Don’t feel like you have to stick store bought vases either! Thrift stores will have some unique looking glass jars that are just begging for an upgrade. For this project you will also need flat bottomed glass beads and some glue. From there you simply glue the beads directly on the vase in whatever pattern and color scheme you choose. You can even use the beads to spell out a name or message which gives it that extra personal touch. These cool little magnets will make a great addition to any fridge while also being a perfect customized gift for anyone on your shopping list. Not only can use personalized photos, but you can use any type of picture or art you wanted depending on the look you are going for. While this craft takes a little more time and planning than others, the end results are totally worth it. For this project you will need flat bottom clear glass beads as well as circular magnets. It is important to make sure that the magnets are smaller than the beads for a cleaner look. You will also need to print out small pictures of your choice, just make sure they are small enough to fit securely underneath the glass bead. Simply attach the picture to the flat bottom of the bead using some clear glue and let dry completely. Make sure that the picture is facing upwards so that you can see it clearly through the bead. After your bead is dry seal the back with a little glue and place a magnet. Not only can you take pride in your handmade gift, but whoever receives them will appreciate the time and effort that went into making such a personalized present. Glass beads are no longer reserved for only jewelry. With a little creativity and planning, you are sure to produce something beautiful and fresh that you can take pride in. Best of all, because of all the different styles and colors that glass beads are available in, the options for creativity are truly endless. So be daring, be creative and most importantly, have fun! Good luck. Rebecca is a freelance writer and editor at http://www.midlandstone.ie, a company that sells and distributes natural stone, patio slabs, garden furniture and glass marbles in Ireland. When working with glass beads there are so many different projects that are easy to take on and also have some amazing results. This entry was posted in Home Improvement and tagged Clear Glass Beads, Decorating, diy, glass, Glass Bead Projects, Glass Beads, Home Decor, Home Improvement, Jeweled Mirror, Jewelry Making Crafts, Picture Magnets, Wind Chime. Bookmark the permalink.